Do try this at home! That's the message from the culinary geniuses at Cook's Illustrated. 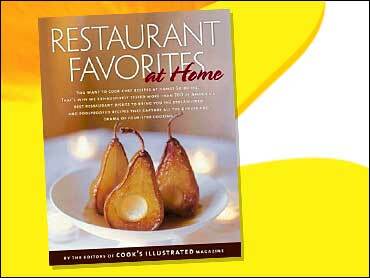 Their latest book, "Restaurant Favorites At Home," is full of some of our best-liked restaurant meals, minus the guesswork. Chris Kimball, founder and editor of Cook's Illustrated, visits The Early Show Monday to present five finished restaurant dishes whose recipes have been pared down so as not to intimidate the home cook. Corners have been cut, recipes modified, sample sizes whittled down. But despite it all, Kimball says taste and visual presentation were not sacrificed. Bring the salmon fillets to room temperature about 30 minutes before cooking to avoid prolonging the cooking time. Cooking the asparagus separately gives you control over the tenderness of the spears and prevents overcooking once they are added to the broth. Avoid using expensive extra-virgin olive oil for poaching the fish, since there's no discernible difference in flavor between it and less expensive varieties in this dish. FOR THE BROTH: Melt the butter in a medium saucepan over medium heat until the foam subsides. Add the carrot, onion, garlic, and 1/2 teaspoon salt and cook, stirring frequently, until the onion softens and turns light brown around the edges, about 10 minutes. Add the wine, bring to a simmer, and cook until reduced to 1/2 cup, about 5 minutes. Add the chicken broth, 1 1/2 cups water, lemon juice, lemon grass, parsley sprigs, thyme sprig, cloves, bay leaves, a pinch of white pepper, and cayenne. Increase the heat to high and bring to a boil. Reduce the heat to medium-low and simmer until the liquid is reduced to 3 cups, about 5 minutes. Remove the pan from the heat and strain the broth through a fine-mesh sieve into a medium bowl. Return the strained broth to the saucepan. Set aside. FOR THE ASPARAGUS: Fill a medium bowl with ice water. Bring 2 cups water to a boil in a large skillet over high heat. Add the asparagus and cook until just tender, about 1 minute. Turn off the heat. Using tongs, immediately transfer the asparagus to the ice water. Cool for 1 minute, then drain the asparagus, pat it dry with paper towels, and cut the spears into 2-inch lengths. Set aside. FOR THE SALMON: Adjust an oven rack to the middle position and heat the oven to 200 degrees. Season the salmon fillets on both sides with salt and pepper. Heat the olive oil in a large roasting pan over medium-high heat until the temperature of the oil reaches 250 degrees on an instant-read thermometer. Using a large, metal, spatula, and adding several fillets at once, submerge the salmon in the warm oil in a single layer. Transfer the pan to the oven. Cook the fillets, turning halfway through cooking, until the center of the thickest part of the fillets changes from bright to pale pink, about 6 minutes total. Remove the salmon from the oven. Transfer the fillets to a wire rack set over a rimmed baking sheet, placing them on their sides. (Discard the oil.) Using your fingers and the tip of a paring knife, peel the skin from the fillets. Discard the skin and set aside the fillets on the wire rack. TO FINISH THE VEGETABLES: Bring the lemon grass broth to a simmer over medium-high heat. Add the mushrooms, tomatoes, and chopped thyme and stir gently to combine. Add the asparagus and simmer for 30 seconds. Remove the broth from the heat and stir in the chopped chives and tarragon. Adjust the seasoning with salt and white pepper. TO SERVE: Place two salmon fillets in the center of each of 6 large soup bowls and pour 1/2 cup of lemon grass broth over the salmon in each plate. Using a soup spoon, arrange the vegetables around the salmon. Serve immediately. Unsweetened carrot juice can be purchased in natural food stores and many supermarkets. Use a blender for pureeing the soup; it produces a smoother puree than a food processor. Both the soup and the charlottes may be made a day ahead and reheated prior to serving. A microwave is the best way to reheat the charlottes, since they may be heated in the disposable cup "molds." Bring 1 cup of the carrot juice, 2 tablespoons of the olive oil, the baby carrots, 1/4 teaspoon salt, and a pinch of pepper to a simmer in a medium saucepan over medium-high heat. Reduce the heat to medium-low and cook, stirring occasionally, until the carrots are just tender and can be pierced with the tip of a knife, about 7 minutes. Gently strain the carrots, reserving the liquid. Return the carrots to the pan, cover, and keep warm. Add the remaining 1 tablespoon olive oil, shallots, leek, and 1/2 teaspoon salt to a large saucepan, over medium heat and cook, stirring occasionally, until the shallots are translucent and tender, about 15 minutes. (If the vegetables begin to brown or stick, add 1 tablespoon water.) Add the raw carrots, the remaining 2 cups carrot juice, the baby-carrot-braising liquid, and 1 cup water. Increase the heat to medium-high and bring to a simmer. Reduce the heat to medium-low and cook until the carrots are tender, about 15 minutes. Transfer the mixture to a blender (in batches, if necessary) and process until smooth, about 1 minute. Return the soup to the pan, adjust the seasoning with salt and pepper, cover, and keep warm. Bring 4 cups water, the celery root, and 1 teaspoon salt to a boil in a medium sauce pan over medium-high heat. Simmer until the celery root can be easily pierced with a knife, 7 to 8 minutes. Using a wire skimmer or slotted spoon, transfer the celery root to a food processor and add the butter. Process until smooth, about 1 minute, scraping down the sides of the work-bowl as necessary. Add the parsnips to the hot water and simmer until tender, 4 to 5 minutes. Transfer the celery root to a large bowl. Gently fold in the parsnips. Adjust the seasoning with salt and pepper. Using scissors, trim 6 microwave-safe, 3-inch-wide disposable cups to a height of 2 inches (the average length of the baby carrots) and spray with nonstick cooking spray or rub with a thin layer of olive oil. Following the illustrations on page 72, drop a small dollop of the celery root and parsnip mixture into the bottom of each cup. Line the circumference of each cup with the braised carrots, cut-side facing outward. Use a spoon to fill the centers with the celery root and parsnip mixture, gently packing it down. If the charlottes are cool to the touch, microwave them until warm. Invert a charlotte cup in the center of each of 6 warmed, shallow soup bowls, pressing slightly on the sides of the cup so that the charlotte slides out freely. Gently pour the soup from a measuring cup or ladle around the charlotte, being careful not to splash the charlotte. Garnish with chopped tarragon and serve immediately. The cake, filling, and tuiles can be made up to 2 days in advance. The cake and filling should be refrigerated, while the tuiles should be left at room temperature. The Bittersweet Chocolate Sauce and the Caramel Sauce yield more than you'll need for this recipe. FOR THE CAKE: Adjust the oven rack to the middle position and heat the oven to 350 degrees. Spray an 8-inch square cake pan with vegetable oil spray and dust it lightly with cocoa powder. Line the pan bottom with parchment paper and set aside. Sift the sugar, flour, remaining 1/2 cup cocoa powder, baking powder, and salt together in a large bowl and set aside. Whisk 1/2 cup room-temperature water, milk, eggs, vegetable oil, and vinegar together in a medium bowl. Pour the milk mixture into the flour mixture and stir slowly with a whisk to combine. Pour the latter into prepared cake pan and bake until a toothpick inserted in the center of the cake comes out clean, 30 to 40 minutes. Transfer the cake to a wire rack to cool completely. Leave the oven on. FOR THE FILLING: Mix the condensed milk, melted butter, vanilla, coconut, and pecans together in a small bowl until uniform. Cover with plastic wrap and refrigerate. Remove from the refrigerator 15 minutes before assembling the cakes. FOR THE TUILES: In a standing mixer fitted with the paddle attachment, beat the butter and confectioners' sugar on medium-high speed until light and fluffy, about 2 minutes. Reduce the speed to medium-low and add the egg whites, 1 at a time, beating after each addition until thoroughly combined and scraping the bowl as necessary. Add the vanilla and mix thoroughly. Reduce the speed to the lowest setting, add the flour, and beat until just incorporated, about 30 seconds. Give the dough a final stir with the rubber spatula to ensure that no pockets of flour remain on the bottom. Make a tuile stencil (this process is illustrated in the book). Turn a rimmed baking sheet upside down and grease the bottom with butter. Using a small, offset spatula and the stencil, spread the batter evenly inside the stencil on the prepared baking sheet. Bake until lightly golden, 5 to 8 minutes. Open the oven door but do not remove the tuiles from the oven. Using a small offset metal spatula, remove one tuile from the oven and drape it over a large, steadied rolling pin or wine bottle, using your fingers to wrap it around the pin. Repeat with the remaining tuiles. Gently transfer the tuiles to a plate and set aside. TO SERVE: Invert the cooled cake onto a cutting board and peel back the parchment. Flip the cake right side up. Cut the cake into nine 2 2/3-inch squares. Slice each square horizontally through the middle into two layers. Spread 2 tablespoons filling over each bottom slice. Replace the top cake layers on top of the filling and transfer to individual plates. Dollop 2 teaspoons of the remaining filling on top of each cake. Gently adhere a tuile to the filling. Drizzle each plate attractively with the chocolate and caramel sauces. When whisking the sauce to combine, do so gently so as not to create air bubbles, which will mar its appearance. This sauce can be cooled to room temperature and refrigerated in an airtight container for up to 3 weeks. To reheat, transfer the sauce to a heatproof bowl and set over a saucepan containing 2 inches of simmering water; stir occasionally until melted and warm. Alternatively, transfer the sauce to a microwave-safe bowl and heat on 50-percent power until melted and warm, stirring once or twice, 2 to 3 minutes. Bring 1 cup heavy cream, corn syrup, butter, and salt to a boil in a small nonreactive saucepan over medium-high heat. Remove from the heat and add the chocolate while gently swirling the saucepan. Cover and let stand until the chocolate is melted, about 5 minutes. Uncover and whisk gently until combined. If necessary, adjust the consistency by heating up and adding the remaining 1/4 cup cream. If you make the caramel sauce ahead, reheat it in the microwave or in a small saucepan over low heat until warm and fluid. When the hot cream mixture is added in step 3, the hot sugar syrup will bubble vigorously (and dangerously), so don't use a smaller saucepan. Measure 1/2 cup water into a heavy-bottomed 2-quart saucepan. Pour the sugar in the center of the pan, taking care not to let sugar crystals adhere tot he sides. Cover and bring to a boil over high heat. Once boiling, uncover and boil until the syrup is thick, straw-colored, and registers 300 degrees on a candy thermometer, about 7 minutes. Reduce the heat to medium and cook until the syrup is deep amber and registers 350 degrees, 1 to 2 minutes.